50 Room hotel offering comfortable and spacious guestrooms, hot tub and sauna. At door parking with interior corridors. 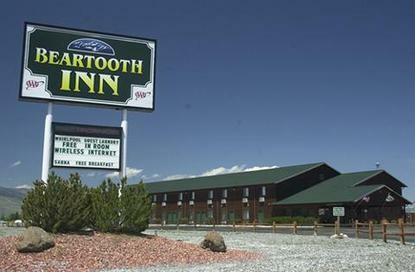 Just 52 miles from Yellowstone National Park and 2 minutes from the airport, The Beartooth Inn of Cody offers complimentary deluxe continental breakfast and in room high speed wireless internet. Room ammenities include refrig/microwave, coffee maker, hair dryer, and iron/ironing board. Free coffee, tea, hot chocolate and newspaper in lobby. MINI-SUITES W/ WHIRLPOOL, AS WELL AS LARGE FAMILY ROOMS AVAILABLE AT PROPERTY - CALL HOTEL DIRECT FOR AVAILABILITY.